It may have not escaped your notice that spring seems to be hiding at the moment. Still, as the car needed the MOT doing, I got on the bike and cycled into work. Not a bad ride in (although it was a bit cold). Then come lunchtime the “isolated shower” that was forecast came over. Well the so called “isolated shower” was still chucking it down by 6pm. All I can say is the ride home was awful, every pot-hole was full and the road was like a river. When I eventually got home the bike went straight in the garage and I went straight in the shower to warm up. This better not be the normal weather pattern again this year. Time is ticking to get some miles in. My ride home looked a lot like the Tour of Britain last year. Meanwhile, while we are all waiting for spring, please take a look at what Mind are all about and consider sponsoring me. Bees and Bikes don’t mix. Not much training this week, it has been too cold and wet again. I have the usual commutes to work and on the new bike as well. We have had a few breaks in the cloud so my attention has turned to the bees and making sure they are all in good stead during the cold. Regular trips to the apiary at the moment to keep them topped up with sugar (the energy they need to keep themselves going throughout the winter months) Usually this just involves checking the weight of the hive and if it is getting light, add a few blocks of bakers fondant (that white stuff on iced buns) under the roof of the hive. So I decided to combine the cycling with the beekeeping tasks and cycle down to the Apiary to feed them. It was a nice bright evening although a bit cold so the bees should all be asleep. I cut up some fondant ready for the ladies and then realise that I am dressed in Lycra. YELLOW AND BLACK LYCRA !! I must look like some very large bee to them. This is not really going to provide me much protection against a hive of bees. 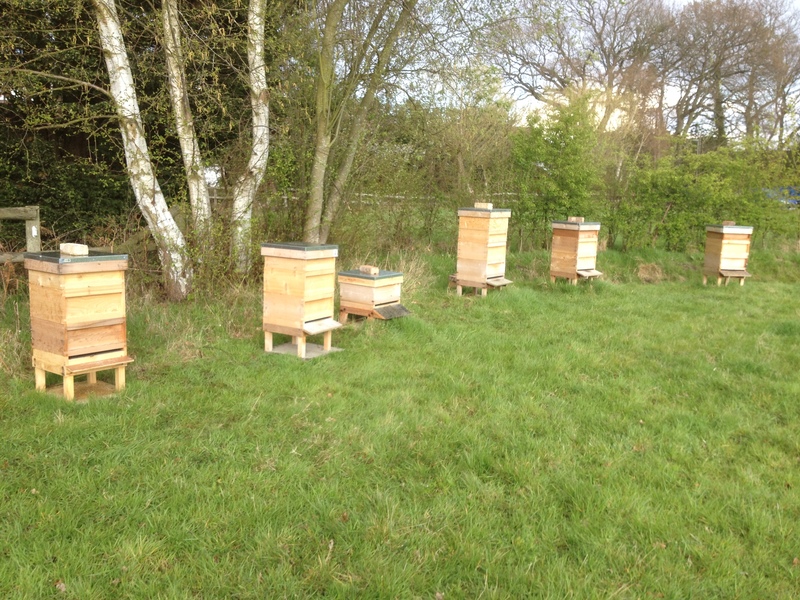 So the 1st three hives are nice and quiet, just a few cold looking bees who are very welcome for a bit of sugar. The fourth hive, is obviously doing very well as when I pull the lid off, there is an explosion of bees. Obviously pulling the roof off someones house is not going to put them in the best mood. I throw the fondant under the lid and shove the roof back on quickly as I can, but it is too late. The next scene is of me, making a rapid retreat across the field followed by angry bees. I got a total of 4 stings, which obviously went straight through my cycle clothes. After 100 meters the bees give up and leave me to nurse my wounds. One very painful ride home later and I break out the anti-histamine cream. I got round the 62 miles in 4 and a half hours with a couple of 10 min food stops, so I was happy about that. The going got really tough later on as the course turns back east, right into Sian Lloyds weather machine’s exhaust. A freezing cold wind in your face is not nice on a bike as its like pedaling uphill all the time (I did make it a bit easier on myself by finding a rather portly gentleman and sitting on his wheel for 15 miles. If you are interested in the route / cycling stats they are here. Still it was a great day out, and a good training ride for the 1st one of the year. Next one is a few weeks time. Both of these people have medals. 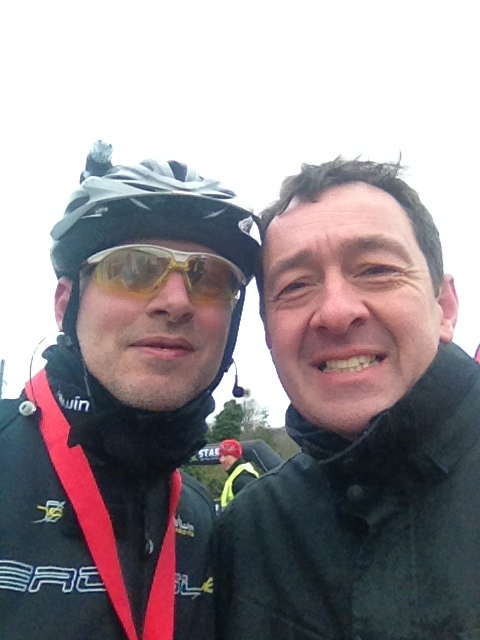 One is Olympic Gold the other is a “Cycling Weekly Sportive completion medal” Can you work out who ? Not much bike time this week, weather has been awful again. BUT the new bike has arrived, so looking forward to getting some use on that. 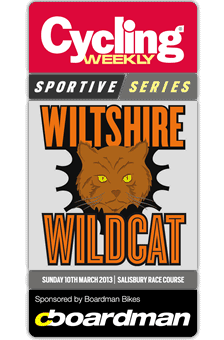 Tomorrow is the 1st Sportive of the season – The Wiltshire Wildcat. So look out for some pictures and details soon. 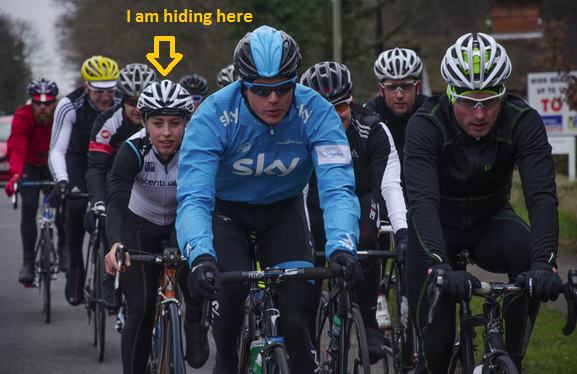 On the another note, team sky posted some pictures from Ben Swifts ride on their website. (Am not in shot but thought it fun to highlight my position). 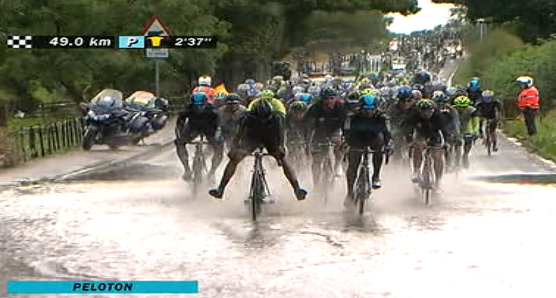 Riding in the peloton with Team Sky on the front.